Declining Black Readership Is So Problematic For African-American Writers. You are here: Home / Misc. / Book Club/Book Reviews / Declining Black Readership Is So Problematic For African-American Writers. 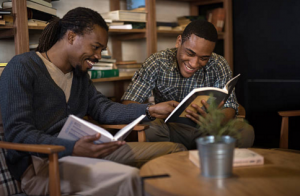 (ThyBlackMan.com) I guess that we should not be shocked when a bit of sadness or depression results from the realization that there are very few independent black writers addressing pertinent issues affecting Black America. If one is not careful about their thought processes, they will find themselves believing that the Black Community is a place that is hostile to intellectualism. Instead of substance, it appears that our people are desirous of superficial black romance novels set in urban settings or pimp chronicles that do little to illuminate the mind and everything to reinforce deplorable stereotypes and caricatures of a black populace that is already woefully maligned in public spaces. I am absolutely certain that my concern with this issue flows from my disappointment with African-American collegians whose exposure to and willingness to engage great black texts is often non-existent. As an African-American studies professor, my initial interaction with my students occurs with me asking them to introduce themselves, to aid this often painful process I ask them a simple ice-breaker question of “What is your favorite book or who is your favorite author.” The answers that I receive regarding this simple query are in a word frightening. By the time that the last answer is given, my feelings are vacillating between anger, disappointment, and frustration that the tradition of great black writers and books could very well reach an inglorious end with this most recent generation. This moment always causes my mind to retrieve what I now consider to be the sage advice of former student Nicholas Malone of The Academic Grind Center who poignantly asserted, “But Jones, you have to remember that no one is reading anymore. They are watching Youtube Videos to get their knowledge.” Although I hate to admit it, I now realize that Malone’s observation is correct. Therein lays the answers to one of my most common questions of “what are they reading?” The sad answer is that they are not reading anything, particularly anything that will illuminate their mind in regards to what it means to be the descendant of stolen and enslaved Africans in a land that abhors their continued presence. Let’s be honest about this matter, at this present moment black writers, regardless of the quality of their scholarship or creativity, are largely irrelevant to the masses of African-Americans. Although many may consider this assertion to be biased as I am a writer, however, the blame for the marginalization of serious black writers at this present moment must be placed on the intellectually narrow shoulders of African-Americans who have found satisfactory titillation living shallow lives filled with gossip, foolishness, drinking/drugs, and entertainment outlets that guarantee the extension of black misery and suffering for them and their offspring. When it comes to intellectual endeavors, the only thing worse than being lost is not realizing that you are lost, and have no desire to alter this depraved state. It is in this netherworld that I find the vast majority of young Black America. Make no mistake about it, any marginalized population whose only means of educating themselves flow from their oppressors fountain of knowledge will never realize their subordinate status, but also will eventually begin to exhibit signs that remind one of Stockholm syndrome; meaning, that blacks will seek to not only assimilate with their oppressor but also work to further substantiate and strengthen the very system that has historically oppressed them. It is this situation that has led the masses of black folk to tune-out poignant African-American writers of today and yesterday. What is quite possibly the most frustrating aspect of this sordid situation is that within these same hollow vessels of intellectual nothingness that my students arrive as I recognize raw intelligence and mental acumen. The realization that they have the ability to engage great black writers leads me to the conclusion that their minds, the most precious resource Black America has, have not been directed in such a direction. Although I am far from a conspiracy theorist, the truth of the matter is that there has to be something afoot when school boards and the administrators who execute their directives decide that The Diary of Anne Frank is mandatory while works such as Native Son, Assata, The Third Life of Grange Copeland, Some Soul to Keep, The Invisible Man, and The Autobiography of Malcolm X are unworthy of being taught in American classrooms. An educational process that mutes the voices of Alice Walker, Alex Haley, Octavia Butler, Richard Wright, Toni Morrison, and James Baldwin will ultimately mute the genius of succeeding generations as it will starve from intellectual freedom and stimulation. Make no mistake about it, an irrelevant school curriculum has led to many African-American students non-desire to engage black literature and intellectual ideas in a significant manner. Ironically, if Manhood, Race, and Culture were not an independent space where I am beholden to no one, I would be unable to address this matter with the truthfulness that I have. I prefer my independence, regardless of the financial costs; and rest assured, there is a steep economic cost associated with that decision. I understood long ago that white media outlets would never allow a voice such as mine to emerge without censoring it in some form or fashion. The fact that serious black writers have to maintain some type of relationship with white entities to ensure their material survival should be the epitome of embarrassment to Black America. However, I have found that Black America has neither shame nor embarrassment when it comes time to support black writers who have sacrificed their lives illuminating a path to liberation. Apparently, they are not seeking to become free. The absence of black support via the purchase of even a single book, a voluntary donation, or a quick note makes the road that independent black scholar’s traverse not only lonely but also incredibly dark and daunting. So on behalf of all independent black writers let me encourage you to offer some signal that you appreciate what we do because it is hard out here on those of us who have yet to bow our heads and go work for the man. A writer should determine and write about the universal truths of all human existence. Truths are those aspects of humanity that do not change that are common to all men and women. That which does not change is real. The reality of human existence is the sameness of all readers black, white, red, yellow or brown. A writer doesn’t have to look very far to know his readership. He need only to know himself. I thirst, therefore I drink. I hunger, therefore I eat. I tire, therefore I rest. All people thirst and hunger. All people get tired and need to rest. All people have feelings, and emotions. All people have a need to be respected, needed and loved. Pain is pain. It doesn’t matter if a white man feels the pain or a black man. Joy is joy. It doesn’t matter if a red man feels the joy or a black man. Find the universals of your subject matter and write about those. That is what authors like Leo Tolstoy, Anne Frank,Albert Einstein,Martin L. King,Jr, Lao Tzu,Mao Tse Tung,Ho Chi Minh, Abraham Lincoln, John F. Kennedy,Shakespeare, Desmond Tutu, Winnie Mandela,Fidel Castro,Marx and Engels, Socrates, Aristotle,and Malcolm X all did. When you do this you will engage the interest and readership of all men and women regardless of race, creed or color. I SHARED YOUR ARTICLE TO MY FACEBOOK PAGE AND MY FACEBOOK THREAD. KEEP PREACHING MY BROTHER! I totally get what you are saying my brother! If black folk think that some white person is going to sit down and write a book blueprinting or outlining the path to African American economic freedom; they will be waiting until hell freezes over! And based on the Holy Bible, that’s not going to happen in my life time.